A dramatic traverse of Hurricane Hill (Little River to Elwha River), with howling winds just scant hours before the arrival of the first winter snows. Low water levels on Little River streams meant no fords were required during our ascent. The Elwha River has made substantial altercations to segments of the old road, such that the final 2 mile traipse from the Ewha-Hurricane Hill trailhead to the Madison Falls trailhead has now become ~3 miles (plus several hundred extra feet of gain) on the new bypass trail. A photo of this bypass trail map can be seen here. We used a partial ‘one day lull’ in recent storms for a final snow free 2018 traverse. Calm conditions and intermittent blue skies beckoned as we made our way up the Little River trail. 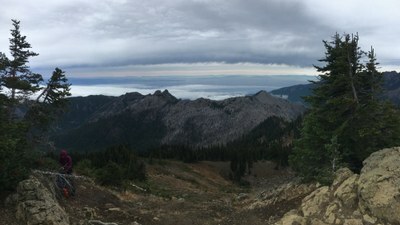 By the time we reached the Hurricane Hill summit cold winds were howling and a wall of wet could be seen approaching from the SE, prompting a quick skedaddle to tree line on the Elwha - Hurricane Hill trail. The wet held off for our descent to the Elwha, but the final road walk was a classic northwest dump. Total time cars-to-cars was ~9 hours, with ~5 hours for our ascent on this ~18 mile/5,200’ gain trip. Photos from this and other trips to this venue can be seen here.